When someone told this, it looks unbelievable. Normally hair roots start to grow after 3-4 months of hair transplant, sometimes even more time is required if during extraction or implantation of the grafts they suffer from some insult like ischemia or microdamage to the bulge area of the hair root where stem cells are located. So after implantation of the grafts, they usually go into the “anagen effluvium” ie hair which is growing from the roots fall between 3 weeks to 6 weeks of hair transplant. New hair starts after 3-4 months of hair transplant initially this hair is thin and gains its thickness with the time and is permanent. If we can control insult to hair roots at each and every step of the hair transplant than Anagen effluvium can be prevented, also preventing microtrauma to the graft not only initiate early growth but the thickness of the hair root is also better. Hair transplant is a teamwork and many technicians are involved in the procedure. Though our technicians are well trained, experienced and full-timer, we keep watch on every step of hair transplant for quality control. • Powered Hair Transplant – In this procedure, Grafts are kept in Plasma so they get nutrition and are in the same biological atmosphere as in the body. • We also do one session of PRP on the day of hair transplant. Growth factors released from the platelets promotes the growth of the existing as well as transplanted hair roots. • No touch to Root technique is used for implantation. This is the wonderful technique as the handling of the vital parts of the root is negligible so the microtrauma to the graft does not take place and this promotes early growth. These are the main reasons to get early growth of hair after hair transplant procedure. In both FUT and FUE we do the Powered hair transplant. FUT is the procedure which is done rarely nowadays. The patient doesn’t want this procedure because of long cut and suturing and doctors also avoid this as it is more demanding and the big team is required. Many centers do not have the well-qualified surgeon and/or technicians who can perform FUT. It is also known as the old technique by some persons. FUT is not the old technique, it has some definite advantages. The grafts taken from the thin strip are from the safe most zone of the donor area. We can call them the most permanent. Results of hair transplant depend on the capabilities of the surgeon and his team not on the type of procedure. 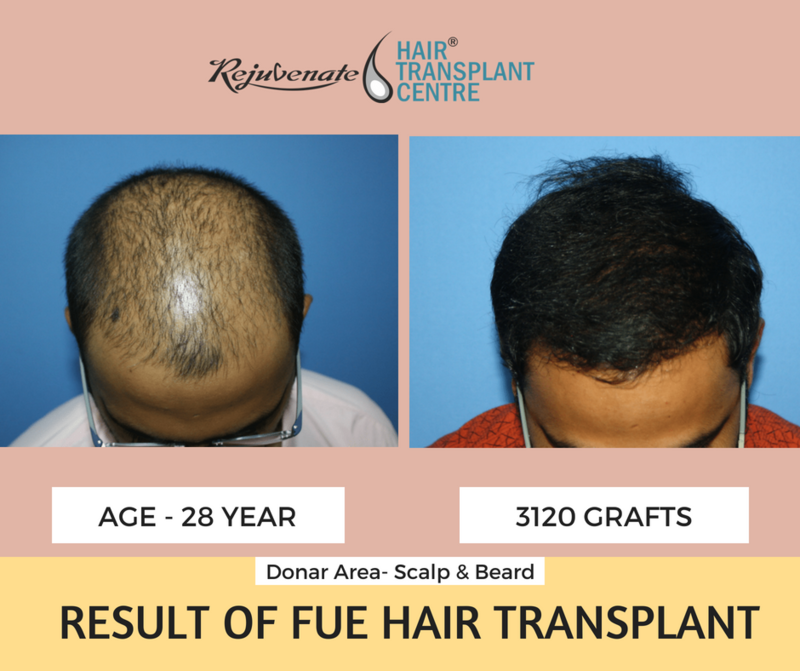 Here we are presenting an interesting case of FUT hair transplant natural results (3120 grafts) done in the last week of October 2016 at Rejuvenate hair transplant centre, Indore. A 27-year-old male came with complains of hair loss. He wanted hair transplant. On taking detail history, there was no other illness and he was a healthy male with grade V androgenetic alopecia. His donor area was good in terms of quality, density, laxity, and color of hair. We suggest him for 3000 grafts (6000 + hair). As in FUE large area of scalp needs shaving so person prefers to go for full head shaving. He wanted FUT as he didn’t want to shave his head. This is a big advantage of FUT as from the donor area no one can make out that person has gone for surgery, suturing mark is hidden in the long hair of scalp from the very first day of surgery. So FUT Hair transplant of 3120 grafts was done by using Powered hair transplant technique. Grafts were kept in Plasma and PRP did during the procedure. The procedure was uneventful, with no pain or swelling after the procedure. We gave Ropivacaine block post procedure and also keep strip width not more than 1.5 cm in the center and 1 cm on the lateral side. This gives very fine non-detectable scar and negligible pain postoperatively. This study of ours was presented in ISHRS 2016 and AHRS 2017 (International and National conference of hair restoration surgeons). The trichophytic closure was done. At our centre, we give oral antibiotics and painkiller for 5 days. Head bath is given on 4th or 5th day. There were no additional precautions to be taken for transplanted hair – He was very happy now as just after 6 months his profile is changed, and he will get a full result in 8 to 10 months, so expect much better. He kept this procedure secret even from his parents, now after seeing results, they are also very happy.